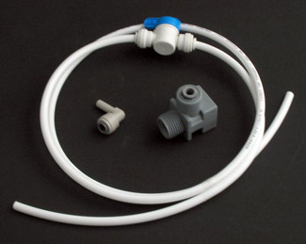 Accessories shown on this page are standard equipment for our Black & White Reverse Osmosis Units. 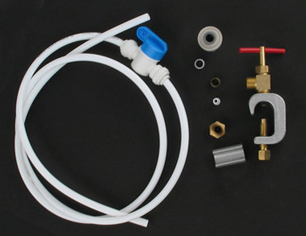 The faucet and inlet valve are used with all our undersink filters. Options are available. Please inquire. Our standard faucets are the Tomlinson brand “Pro-Flo” and Contemporary “Value” style long reach faucets (pictured right.) Either faucet is included with any of our Black & White undersink and reverse osmosis units, and both are available in air gap or non air gap configurations. Tomlinson faucets are the highest quality faucets on the market and are known for their sturdy construction and leak-free performance. Both are NSF-Certified and include a 2 year manufacturer's warranty. Either faucet is included with the price of your unit. 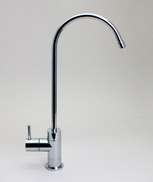 We also offer upgrades to additional styles and finishes on our faucet page. Self-piercing saddle valve with tubing pre-attached at the factory makes an easy installation on copper pipe. This is a sturdy unit that locks in place and has a durable and accurate flow-control knob. Instructions included. Saddle valves are available on our RO Parts page. We supply the MAX Adapter rather than the saddle valve above for customers who wish to install on flexible pipe. 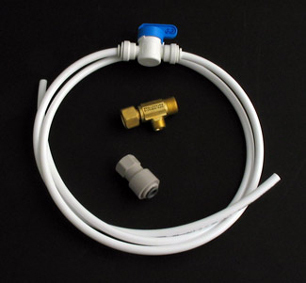 It's the easiest inlet valve ever—just unscrew the flexible tubing from your cold water valve, screw the MAX Adaptor in its place and then reattach the cold water line. Instructions included. 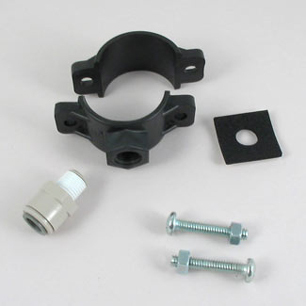 MAX Adapters are available on our RO Parts page. The Murdock EZ Faucet Adapter is similar to the MAX adaptor, but attaches near the sink rather than near the cold water valve. Installation is likewise simple. Just drop the cold water line from the faucet, insert the EZ Adapter, and attach the cold water line to the bottom of the adapter. Instructions included. 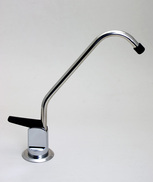 Murdock EZ Faucet Adapters are available on our RO Parts page. You get a drain saddle with a John Guest push-in elbow for extra easy, leak-free installation. It's very easy to install, flows freely, and assures many years of trouble-free performance. Drain saddles are available on our RO Parts Page.